GATES OF LIGHT is part of ICOON AFSLUITDIJK, the design innovation program commissioned by the Dutch Government, which enhances the innovative character of the legendary 32 kilometer Dutch dike whilst highlighting its key functions: water protection & heritage, energy and mobility as an exemplary model of a smart landscape for today and tomorrow. Every day more than 20.000 cars pass by the GATES OF LIGHT. The structures have been fully renovated and augmented with a retro-reflective layer. In the dark, the architecture of these structures is illuminated by the headlamps of passing cars, reflecting the light through small prisms. 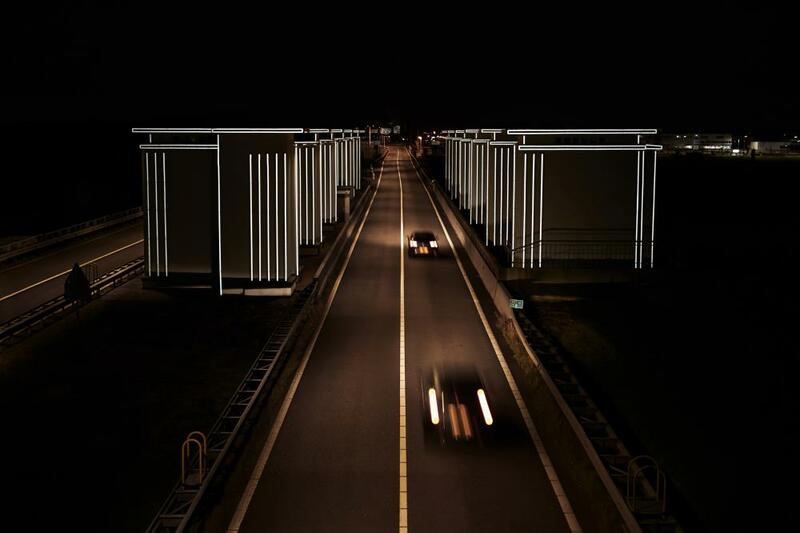 If there are no cars on the road, the structures are not illuminated. This way of using light requires zero energy and does not contribute to light pollution.